The Clock in the Hatbox (1939) is an early title in the Arthur Crook series, only the sixth of fifty-some novels, written by "Anthony Gilbert," a pseudonym of Lucy Beatrice Malleson, who distinguished herself from her contemporaries by blending (domestic) suspense with a formal detective plot – resulting in some unusually-structured mystery novels (e.g. Something Nasty in the Woodshed, 1942). As unconventional as Gilbert's approach to plotting is her morally ambiguous lawyer-detective, Crook, who was accurately described by Nick Fuller as having something of "the gusto and cynicism of Sir Henry Merrivale himself." 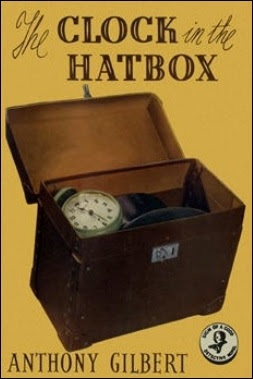 The Clock in the Hatbox appeared on my radar after coming across it on a list, "Recommendations by Nick Fuller," originally posted on the GAD group, which listed this book as the only recommendation under Gilbert's name. John Norris, of Pretty Sinister Books, published a laudatory review of the book last year. Concluding that Gilbert's "unusual treatment" of the detective story, courtroom drama and Hitchcockian suspense culminated in a "mindblowing crime novel." A "landmark mystery novel" that "for some reason is never mentioned in the many studies of the detective novel." There were a number of other reviews that really enticed me. My reason for referring back to their opinion on The Clock in the Hatbox is that, halfway through the story, I began to suspect my own opinion was going to be a contrarian one. And then that ending happened! The story opens with the trail of Viola Ross, who stands accused of having murdered her husband, Teddy Ross, a schoolteacher who was smothered to death and the clue that landed her in the docks was the bedside alarm clock – which was found inside a hatbox in the closet. Whoever put the clock in the hatbox was likely the same person who placed a pillow over the victim's face. And had forgotten to replace it. Viola was only twenty-three when she married Ross, a man twice her age, but the marriage provided Viola with security and Teddy with wife. However, as the years passed, Ross become "the complete domestic tyrant" and alienated his son from a previous marriage, Harry Ross, who refused to become a teacher like his father. Ross resented that Viola sided with his son and even began to harbor suspicions that they were having an affair. Predictably, he died the night before he was going to change his will. So the police had a motive and all of the evidence argued against Viola, as well as public opinion, but a death sentence is delayed when the jury was unable to come to an unanimous decision – deadlocked by a single juror. The result is a hung jury and a new trial date is set. The lone holdout in the jury is an aspiring novelist, Richard Arnold, absolutely convinced of Viola's innocence and is determined to rescue her from the gallows. A mission supported by Arnold's fiance, Bunty, but her support begins to slowly wane when a threatening letter arrives demanding that she tells her boyfriend "he has twenty-four hours left in which the change his mind." However, this threat only works only worked as an incentive to carry on the investigation, because Arnold is clearly making someone nervous. Someone who doesn't want anyone looking closer at the murder, which is where the Hitchcockian suspense and thriller-ish elements of the plot come into play. There are several attempts to kill Arnold, one of them employing the gun-with-a-string trick, but a second tragedy happens when the fumes of a tampered bathroom heater killed a completely innocent man. A man who died in Arnold's place! During his investigation, Arnold engages Arthur Crook, a shrewd lawyer of "the most enviable repute," but Crook is only peripherally involved in the case until he pulls the rug from underneath the reader at the end. Until then, Crook makes a couple of appearances to warn Arnold not to meddle and give their prey the time to gather "sufficient rope" to hang himself. A warning that was duly ignored. A note for the curious: Crook quotes Gilbert's original series-detective, Scott Egerton, a rising politician, who appeared in only ten novels until Crook replaced him in the mid-1930s. Towards the end, Crook tells Arnold how Egerton always used to say "the last trump always lies with fate and she bein' female, there's no telln' how she'll play it." I always like it when mystery writers acknowledge, one way or another, that their various series-detectives live in the same fictional universe. Somewhere around the halfway mark of the story, I began to slowly doubt the judgment of my fellow mystery enthusiasts. After all, the murderer's identity looked to be rather obvious, especially to seasoned mystery readers, which would have hardly justified the lavish praise. Don't get me wrong, it would still have been a well-written, cleverly put together detective novel with a good play on the least-likely-suspect gambit, but I began to think that the book had been overpraised – which is when I arrived at the twist in the story's tail. A triumphant ending that can be likened to Anthony Berkeley's Jumping Jenny (1933). I also understand now why Norris liked the book so much, because The Clock in the Hatbox reminded me of Joan Fleming's Polly Put the Kettle On (1952), which Norris glowingly reviewed. The books are as similar as they differ, mainly in the approach they take to the plot, but, in the end, the similarities really are striking. If you like the one, you'll probably like the other. All in all, The Clock in the Hatbox is a classic textbook example of what it is that attracts me to these cunningly cut gems from the genre's Golden Era. I went in with expectations that were, perhaps too high, but began to get slightly disappointed as the explanation appeared to be obvious in spite of the author's to cover it up as inconspicuously as possible – only to learn at the end that I was supposed to think that all along! The Clock in the Hatbox is without question one of Gilbert's best detective novels and deserves to better known. And speaking of detective stories that (probably) deserve to be better known, I recently got my hands on a genuinely unknown collection of short detective stories. They look very promising and, if they're any good, I might have actually unearthed something interesting. I think there are even some impossible crime stories in this collection! So that surprise collection will be next. You didn't check the link, did you? ;) I only linked to your list or recommendation. Not the GAD review. Gilbert did have a foot in the suspense and thriller genre, but, from what I read, she always tried to keep the other one firmly planted in the traditional detective story. So a good deal of the Arthur Crook novels are hybrids of (domestic) suspense, thrillers and the detective story. How well this works depends on the individual reader, but I quite liked them. And there are a number of titles that are more detective than suspense/thriller (e.g. Death at the Door, The Scarlet Button and Death Knocks Three Times). But none of them are as good as She Shall Die or The Clock in the Hatbox. The more I read Gilbert the more I see she does have a lot in common with Fleming, TomCat. Very insightful comparison to Polly... 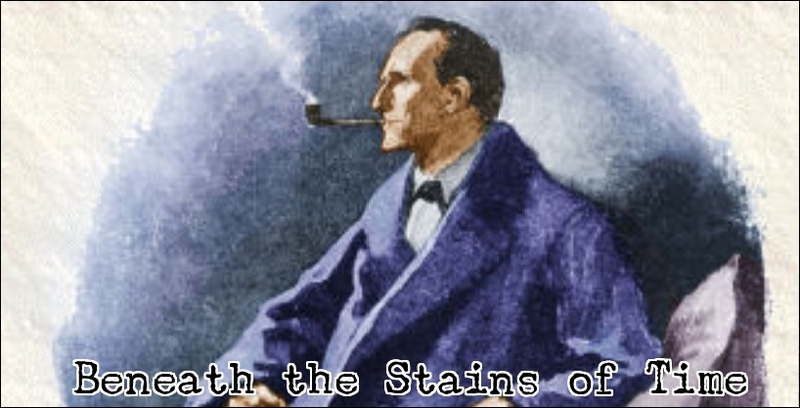 They have a lot in common -- as plotters, as stylists, and as challengers of the conventions of detective novel formulae. Why hadn't I seen it myself? So far I've only encountered one book in Gilberts' vast output that could be called a genuine traditional detective novel, one that Crook actually enters very early in the book and does Q&A style detective work. That one is Death Against the Clock. Though published in 1958 has much in common with The Clock in the Hatbox in that both are about attempts to save wrongfully accused killers. I'll have to find a copy of She Shall Die to see how it stand as alongside my three favorite Gilberts so far: ...Hatbox, Death Knock Three Times and 30 Days to Live. OH! I've also managed to get hold of both books featuring Malleson's little known Parisian policeman M. Dupuy. However, I'm struggling with the first one. I wonder if her very early books from the 1930s (the ones with Egerton, none of which I've read though I have most of them) were as laboriously written as The Man With Button Boots. Hope I manage to finish it. I had to set it aside for a couple of weeks while I read some other much more exciting, interesting and shorter (!) books. 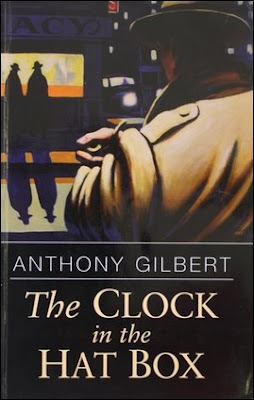 Well, you got me interested in Death Against the Clock and have added the title to my never-ending wish list, but is the book really an example of Gilbert engaging in pure, old-fashioned and undiluted detective work? A race against the clock to save someone from the gallows is, if I'm not mistaken, generally considered to be suspense. So even that one doesn't seem to be entirely free from thriller and suspense influences. I've only one Egerton title on my shelves, The Body on the Beam, but have not yet read it and no idea how much it differs from the Crook titles. However, going by your brief description of The Man With Button Boots, I suppose Gilbert was trying emulate someone like A.E.W. Mason early on in her career, but abandoned that path when she created Scott Egerton and Arthur Crook. Anyway, good luck with getting to the end of the book! Enjoyed your review though I probably won't get a chance to read this as it seems to be a hard to find title - as are the others you mention. Oh well, they're still fun to read about. Well, I have good news for you, Yvette. The Murder Room reprinted Hatbox as a paperback or ebook edition. So you should be able to get your hands on this one relatively easy. So, you finally did read it. And I am so glad that ultimately you didn't find the praise OTT. I myself find it somewhere in the company of Roger Acroyd, Burning Court, ATTWN, but then I am very fond of Gilbert. Usually, it takes some time to finally get around to reading a recommendation, but I rarely forget about them. And this one definitely deserves to be compared to some of the well-known classics.